Recent release, “Blood Knight” from Page Publishing author Dante Crossroad is a gothic horror tale set in the futuristic western nation of Sentinel that tells of a monster slayer clad in black who must protect a young girl from the hordes of Hell. 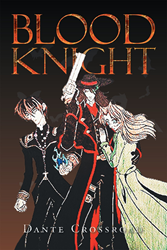 Dante Crossroad, a first time author, has completed his new book “Blood Knight”: takes us into a quiet, out-of-the-way town on the futuristic frontier where vile creatures arise to terrify and destroy, making way for their demonic master to set his plans in motion. Dante Crossroad originally conceived "Blood Knight" as a manga (Japanese-style comic book) during the summer of 2006 after watching "Hellsing" for the first time, but would change the format to light novel after reading "Vampire Hunter D," written by Hideyuki Kikuchi and illustrated by Yoshitaka Amano, two years later. Dante barely managed to graduate high school on time in 2006 and never went to college despite the pushing of his family and friends. His literary influences include H.P. Lovecraft, Hidyeuki Kikuchi, and Lilith Saintcrow. His artistic influences include Akira Toriyama, Yoshitaka Amano, and Ayame Kojima. Published by New York City-based Page Publishing, Dante Crossroad’s riveting tale introduces the reader to a sci-fi-western world steeped in magick, demonic mayhem, and gun-slinging, sword-wielding action that is sure to ensnare the senses and awaken the imagination. On their way home from graduation vacation, Katerina and Charles decide to rest for a night in the small town of Sleeping Willow. Unfortunately, their night of rest quickly becomes one of dread when a hellish horde lays siege to the town. What's more? The horde is led by a foul creature that wishes to make Katerina his bride just as her latent magical abilities begin to awaken. There is a ray of hope, however, when a man clad in black appears to contend with the unholy threat. Armed with a wicked 6-gun, a mystical sword, and possessed of superfluous beauty, this stranger is all that stands between Katerina and mothering an unspeakable horror. He is the shadow feared by darkness. He is the scourge of Hell. He is...the Blood Knight. Readers who wish to experience this mesmerizing work can purchase “Blood Knight” at bookstores everywhere, or online at the Apple iTunes store, Amazon, Google Play or Barnes and Noble.